Finally I have some time to chronicle our trip to Japan on Day #4! 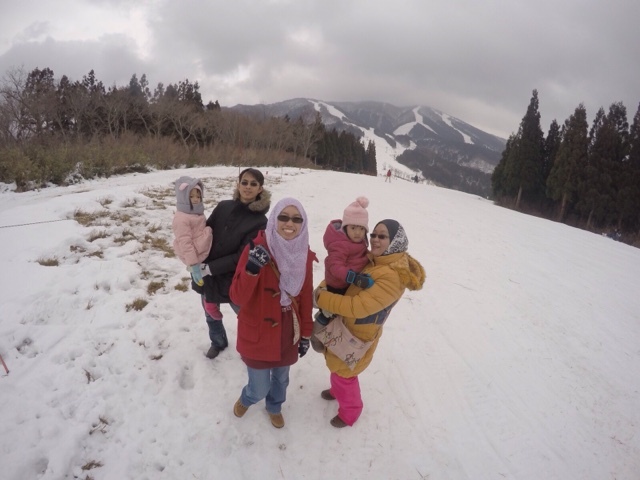 This was the day that my daughters enjoyed very much because they finally get to see, touch, smell and bergolek2 on the snow! Since it wasn't snowing in Japan when we got there (it only started to snow last week! 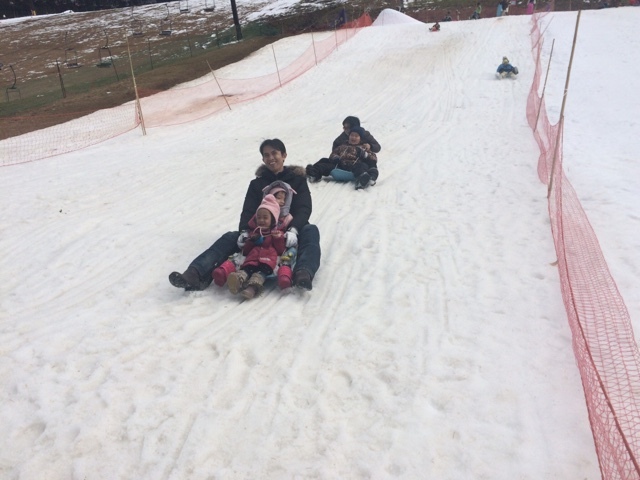 ), the only place we can find snow is in ski resort in Katsuyama, which is on situated on higher grounds. It's just an hour's drive from my sister's place and we departed quite early since the weather forecast reported that it would be raining in the afternoon, and we wanted to spend as much time as possible at the ski resort. At first, we couldn't see snow anywhere on our drive up to the resort, but when we almost reached there, we started to see snow by the roadside. We excitedly woke Khayla up so she could have her first glimpse of the snow. Muka tak berapa excited tapi dalam hati, Tuhan je yang tahu! 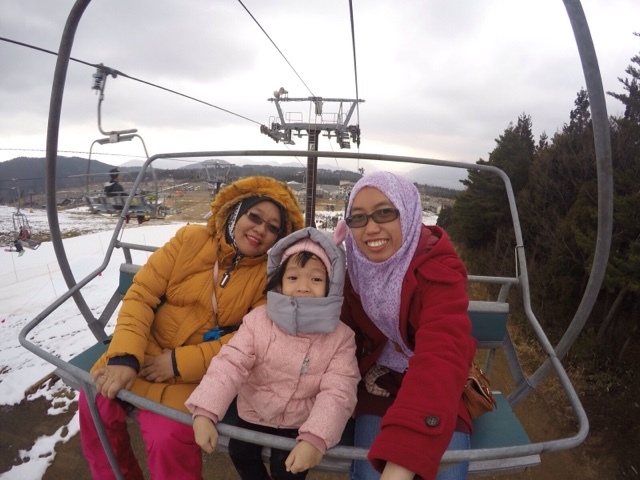 The trip to the ski resort is purely for our kids' entertainment, so we didn't bother checking rentals for ski equipments or any sorts of fees to access the skiing ground on the hilltop. 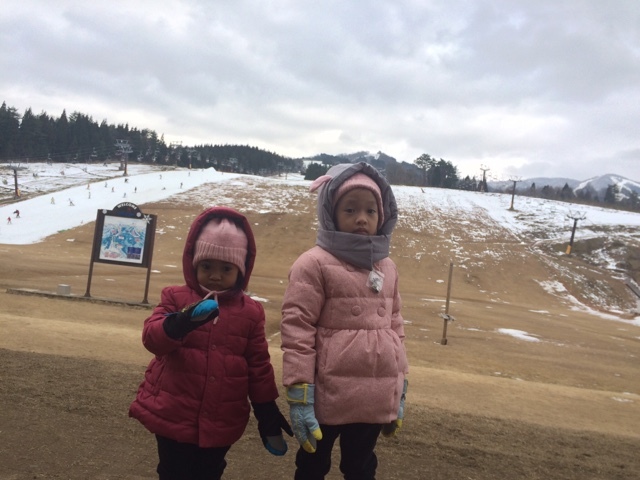 We just wanted to go to the B-Kids Park and let the girls play with the snow to their heart's contents! 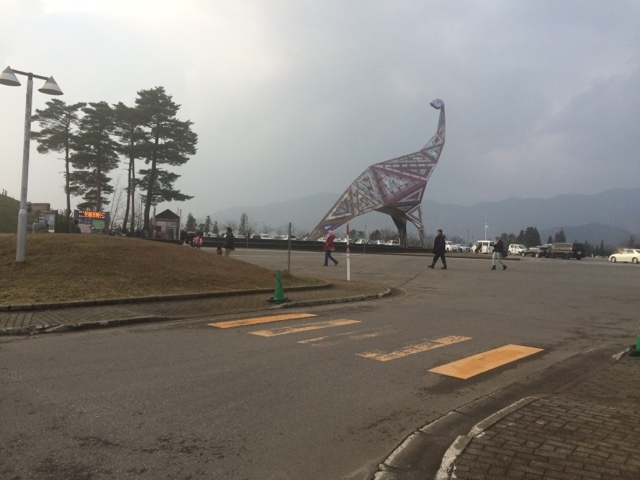 The entrance to B-Kids Park area is ¥500 for half day and ¥900 for full day. We took the half day option since we were already planning to go to the Dinosaur Museum in the afternoon. How the girls enjoyed themselves! Khadeeja, always the adventurous type, could not get enough of going on the sled and sliding on the snow down the slope. Aku pun apa lagi, berkali-kali bawak dia naik dengan alasan temankan Khadeeja, padahal diri-sendiri yang excited nak main! Hehe. Khayla pulak takut sikit and just wanted to build snowmans. Having fun sliding down the slope on a sled! Since we were already at the ski resort, I convinced my sister that we must have a ride on the cable car and take a photo on the hilltop. At first we thought that we had to pay to get on the cable car, but turned out that the cable car ride is free if we didn't intend to ski on the hilltop. 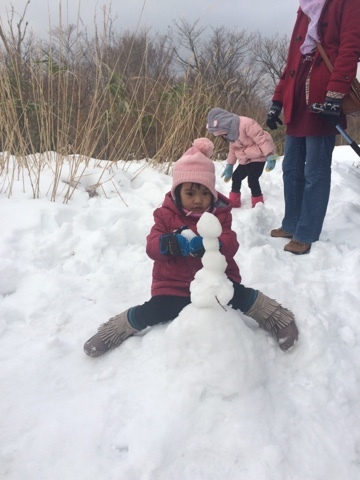 Khadeeja had fun building her snowman and didn't even notice that her non-waterproof boots were all soaked up! By the time we went down and took her boots and socks off, her nails were blue-ish! I had to buy her a new pair of crocs since her boots were really wet. Meanwhile, Khayla just had a blast starting a snowball war with everyone, although most of her snowballs went off-target, LOL! 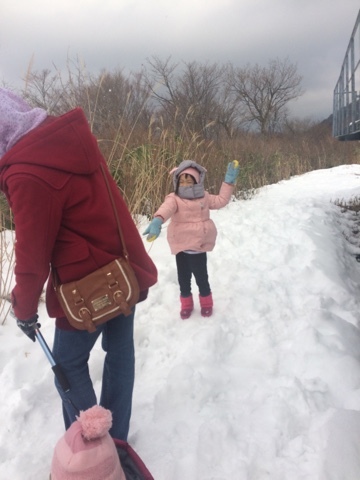 Khayla had fun throwing snowballs at everyone! By the time we had to leave, Khayla was so sad that she cried. She dragged her feet as we left the snow area and eventually broke down and only stopped crying when my sister bought her ice-cream! o_O Tapi aku pun confuse jugak dengan orang Jepun - walaupun cuaca sejuk, dieorang tetap suka makan aiskrim. This museum is located around 10 - 15 minutes away from Ski Jam. It was the perfect trip to cheer up the girls who was so miserable about having to say goodbye to their newfound love, snow. Apparently, this museum is one of the "World's Three Great Dinosaur Museums", two others being in Canada and China respectively. 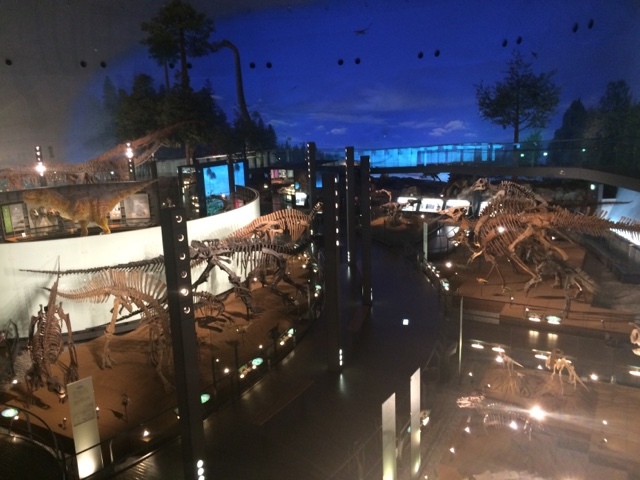 We also learned that there were many fossils found in Katsuyama area a long time ago, and that is why they decided to build the museum here. It was already 3pm by the time we reached the museum, so we decided to have our picnic lunch (rice & chicken curry which I prepped the night before even though we reached home from Nagoya at midnight!) on the benches outside of the museum. Suffice to say, it was quite a horrendous experience because the area is windy and the temperature was around 5 degrees! So cold! 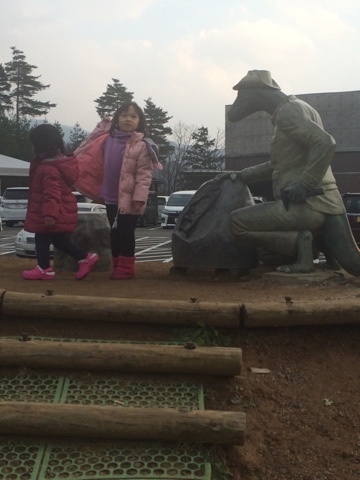 Entrance fee to the museum is ¥720 per person, but kids below the age of 6 enter for free. 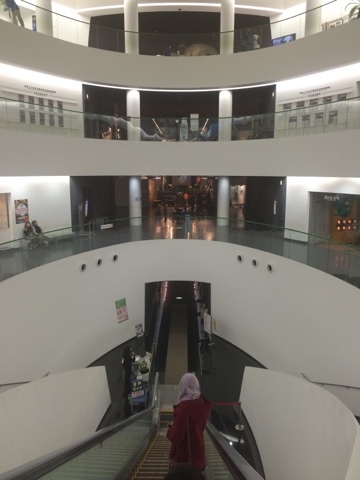 The museum consisted of 4 floors including the basement, but most of the exhibits are located at the basement. 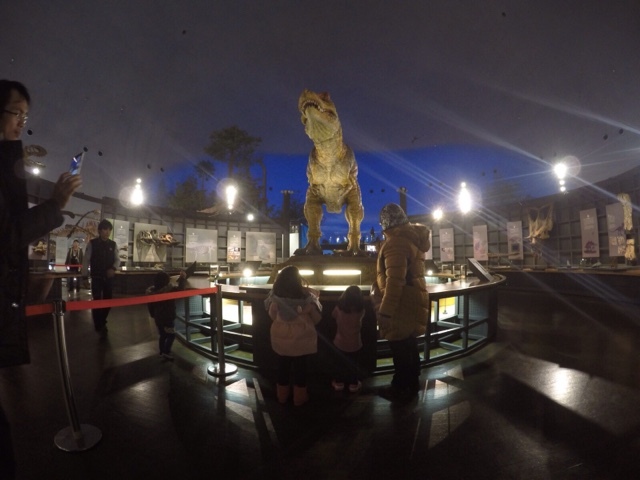 The museum is pretty awesome too and the girls soon forgot about the snow as they marvelled at the dinosaur's replicas and fossils on display. Their favourite exhibit is none other than the robotic T-rex that moves and makes roaring sounds like a real life dinosaur! 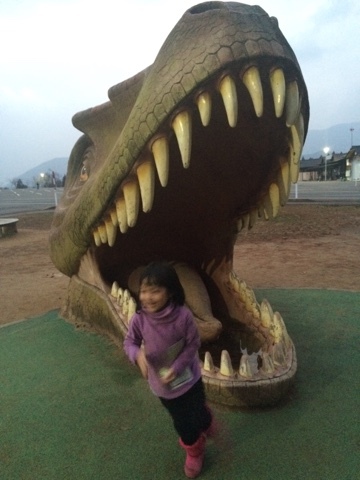 The T-Rex roars and moves - much to our kids' delight! 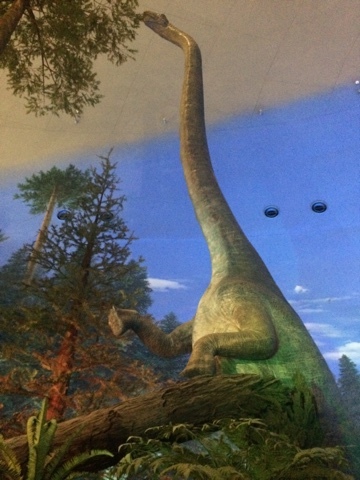 This replica of a giant herbivore stood two-storey high! 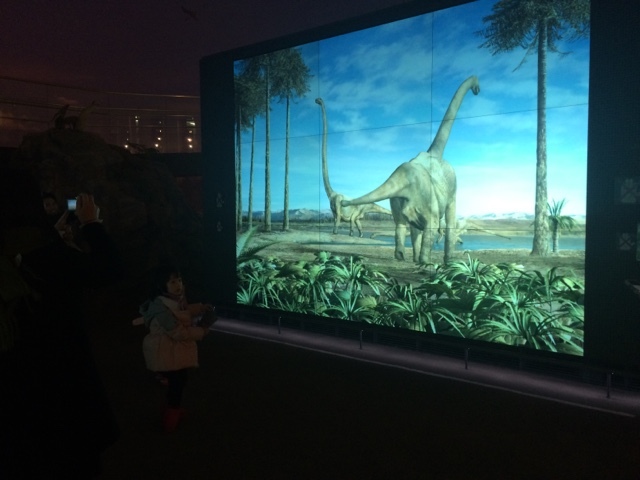 A 3D animation of dinosaurs fascinated my girls because the creatures ran from one screen and appeared at the screen behind them! 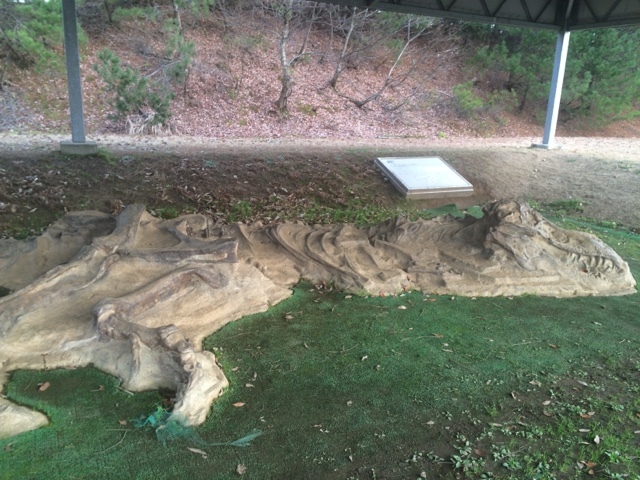 There is also a dinosaur-themed playground outside of the museum, but it looks rather rundown (although still in good condition). We let the girls had a go at the slide before finally getting into the car and out from the cold weather outside. It was our final day in Fukui and we had a great fun. The next day, we made our way to Kyoto and it was really exciting because I got to board shinkansen @ the bullet train! Woohoo!